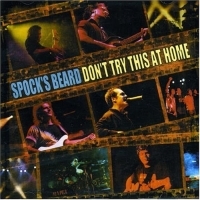 Don't Try This at Home is a live recording of a performance during a Spock's Beard tour through the Netherlands. It's not the best selection and it's clearly not the best production, but it does serve up some nice energy. Most of the live material I've heard from Spock's Beard is usually full of energy and they are quite capable of pulling off their complicated music live. This album just seems more like an afterthought than an actual release and it becomes more clearer when one notices that six live albums were released during the Morse era in a six-year period. Besides the production, I still enjoyed listening to this album and really liked their performances of Mouth of Madness and The Healing Colors of Sound. Live at the Whisky and Nearfest and There and Here are better live albums. If your interested in acquiring a Morse era live album, I would suggest those. This one is good, but not essential. It's also the only one that has The Healing Colors of Sound performed live, so should be a worthwhile purchase for Spock's Beard fans. Three stars.